On World News Saturday, during a story about young Israelis seeking to enjoy life in Tel Aviv to forget about the constant danger of terrorism, ABC's David Muir seemed to suggest that most Israeli cities could be described as relatively "militant" as he compared Tel Aviv to other cities: "Some have called it the 'Tel Aviv Bubble.' But not in a bad way. Other Israeli cities are more religious and more militant." Notably, earlier on the same show, during a brief story on the fighting between the terrorist group Hezbollah and pro-government forces in Lebanon, Muir had merely labeled Hezbollah as an "Islamic group." But, on the bright side, during the story on Tel Aviv, while describing what Israelis face from Palestinian militants, Muir did at least use the word "terror," which is of significance because ABC News has a history, particularly during the era of Peter Jennings, of not labeling Hamas or Hezbollah as terrorist groups outright, in an attempt to be neutral. Also of note, Charles Gibson, weekday anchor for ABC's World News, coincidentally used the word "militant" to label Hezbollah on Thursday and Friday, just days before Muir referred to some Israeli cities as being "militant." DAVID MUIR: And the crisis in Lebanon is easing tonight after days of deadly fighting between supporters of the Western-backed government and the Islamic group Hezbollah. Hezbollah fighters have begun withdrawing from Beirut after the government gave in on a key demand allowing Hezbollah to keep its illegal telephone network. And some consider that a victory for Hezbollah. MUIR: We're going to take "A Closer Look" tonight at one city's response to the constant threat of terror. This week, Israel celebrates its 60th anniversary, but its history is full of conflict. President Bush arrives there on Wednesday to push for new peace talks, and he may find, as we did in one thriving city, a younger generation that has found its own way to survive the turmoil. It is nightfall, and the cab drivers race to get a jump on the evening. The cafes and bars are overflowing. It could be any modern city. But this is Tel Aviv -- Lebanon, an hour and a half to the north; Gaza, an hour to the south. Unease and uncertainty are never far. But in this city, young Israelis told us they try to forget the conflict they've known their entire lives. UNIDENTIFIED MAN: Me personally, I try to, lately anyway, I try to take a little bit, to be a little bit disconnected because I have to live my life and I can't worry about everything that's going on in the Middle East. 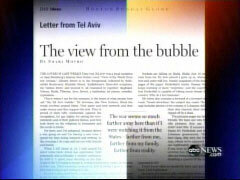 MUIR: Some have called it the "Tel Aviv Bubble." But not in a bad way. Other Israeli cities are more religious and more militant. UNIDENTIFIED WOMAN: I think it has some kind of stabilizing effect on the country. If it didn't exist, all the country would be swept by extremists from both sides. MUIR: Not all of the young people here actually call it the "Tel Aviv Bubble," but most everyone acknowledges there is something that helps to insulate them from all of the conflict around them. And people who study the psyche in this part of the world will tell you, there's a reason for it. PROFESSOR RONALD ZWEIG, NYU TAUB CENTER FOR ISRAEL STUDIES: In the sense that you can insulate yourself from the troubles of the area, I think it really is a very effective bubble. MUIR: Professor Ronald Zweig spent 25 years teaching in Tel Aviv. ZWEIG: Young people, young Israelis, do not necessarily buy into the world views of my generation. They look beyond the conflict. MUIR: In this group of young women, a soldier, fulfilling her 20 months of duty. And an aspiring filmmaker who said this idea of a bubble does not mean they're unaware of the reality. UNIDENTIFIED WOMAN #2: Still, we know where we live, and we can't forget it. It's in the back of our heads. 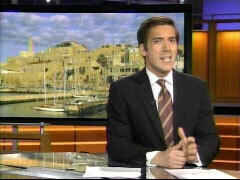 MUIR: The young voices of Tel Aviv, our "Closer Look" tonight.